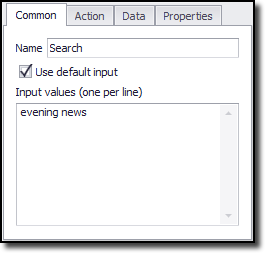 The configuration screen for the Set Form Field command has four tabs - Common, Action, Data and Properties. Use the Common tab to set the command name and select the data provider that provides the input values for the form field. The default data provider for a standard input form field or a radio button is a simple data provider that provides the input values. The input values for a radio button or check box must be either On or Off. The default data provider for a select box form field is a selection data provider. 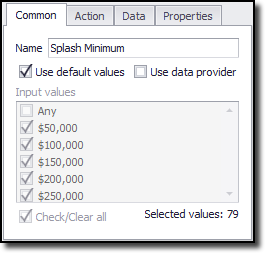 The default selection data provider will attempt to select all appropriate values in the drop-box (select-box), and the Set Form Field command uses those values as input values. Use the Action tab to control how the web browser loads the URLs. See Action Configuration for more information. Use the Data tab to configure a data provider that can provide the form field input values. The Set Form Field command can use the data provider configured on the Data tab, or it can use a data provider configured by a parent command. The Data tab is not available if the command uses a data provider from a parent command. See Using Data Input for more information about data providers.